Bob Hamilton of the Common Good Awareness Project led an east end meander to observe and discuss the relationship between the concrete and social constructions of the city and the soil on which it is built. The common good awareness project, initiated by Bob raises awareness of publicly owned assets in the city and engagement in the common good fund which arises from these assets. What if we understood soil as a common good and the assets as the ecological, social and practical services it provides? Bob proved to be an interesting and informative guide as we took a stroll around the East End. In the spirit of a Parisian flâneur, our route was unplanned and our pace was leisurely as we took time to stop and discuss places and points of interest. 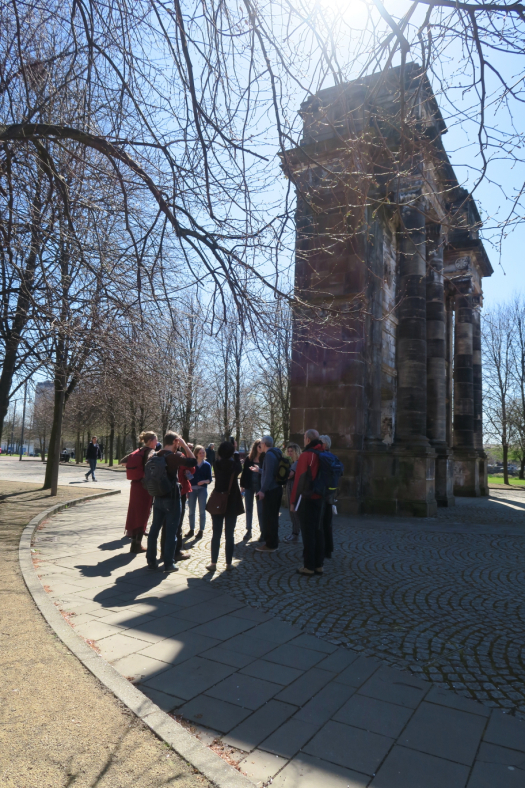 Our first stop was at Glasgow Green, where a legalize Cannabis event provided an appropriate backdrop to discussions surrounding the social role of the commons as well as the ecological importance of their soil. Before starting the walk, Bob had compared the city to the structure of a computer circuit board, with their conductive tracks, pads and copper sheets resembling the roads, pavements and buildings of the city – individual components that all serve a vital function within a larger whole. In providing a breathing space “where people don’t have to do anything, or buy anything” common greenspaces act like the heatsinks and fans of the circuit board, preventing components from overheating and breaking down. 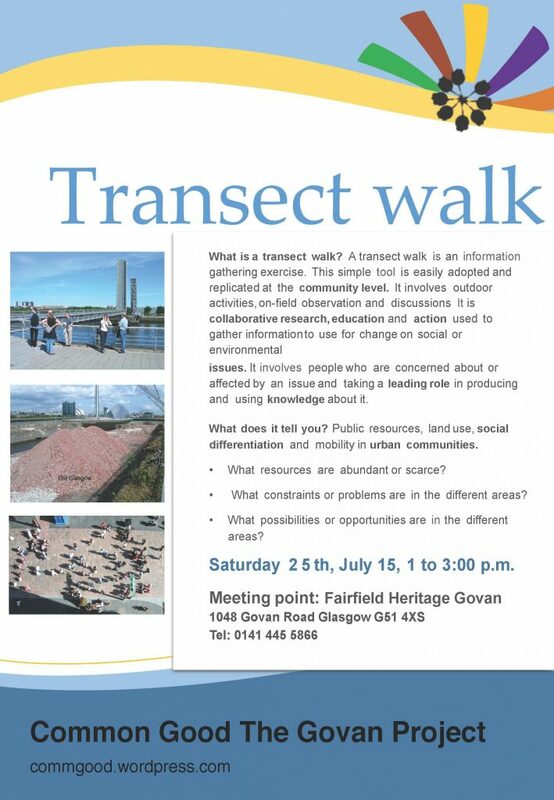 As we looked around Glasgow Green and saw the plethora of people who were enjoying it and the diversity of activities going on, this analogy really resonated. Bob then suggested that we visit Free Wheel North, a cycling development charity based at Glasgow Green as a good example of the ways in which we “can plug-in” to the commons and utilize their benefits for the common good. It was great to see so many people utilizing the vast array of adapted bikes that Free Wheel North offer – a testament to their belief that everyone should have the right to access health, fresh air and exercise. 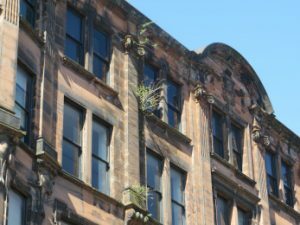 From then on we meandered to Bridgeton Cross, taking the time to look up and appreciate the wealth of architectural heritage that Glasgow has to offer. 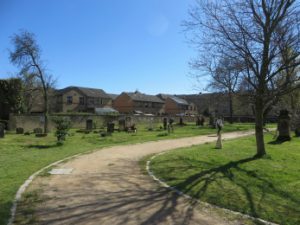 We ended up our walk basking in the sun at the Abercromby Street Burial Ground – a compelling site which contains the graves of three weavers killed in the Calton Weaver’s Strike of 1787. Until recently, this graveyard had long been neglected, but thanks to the efforts of local activists it has since seen renewed attention – not least as the site of a Georgia Hogan exhibitionas part of Glasgow International. Visiting this site for the first time, I was unaware of the role of weaving in the industrial history of Calton and the events of the weaver’s strike. While we enjoyed the sun in its peaceful surroundings, I thought of the importance of such places, and of their soil, as points of connection to the past and as incubators of local identity.